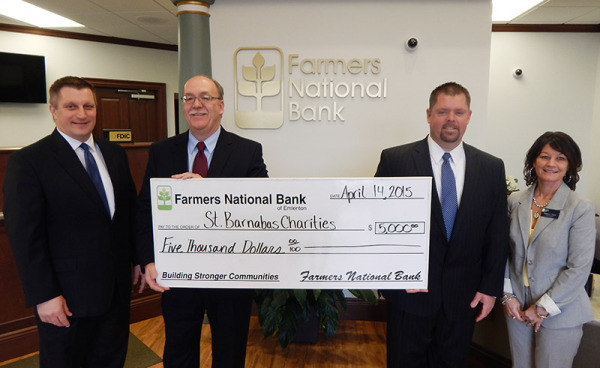 The Farmers National Bank of Emlenton recently donated $5,000 to St. Barnabas Charities. This donation will help support patients in need, who reside at St. Barnabas Nursing Home, Valencia Woods at St. Barnabas and The Arbors at St. Barnabas. “As an active member in the community, we are pleased to give back to those in need, through this local charity. The Bank is committed to making a positive impact in the communities which we serve,” said Robert Vernick, Senior Vice President, Chief Lending and Business Development Officer of The Farmers National Bank of Emlenton. Farmers National Bank Expands into Cranberry Township. . . Farmers National Bank Expands into St. Marys. . . The Farmers National Bank of Emlenton announced that it has signed a lease for a new full-service branch banking office in St. Marys, Pennsylvania. The Bank and the City of St. Marys executed a lease for the new office which will be located in the St. Marys City Hall building. Farmers National Bank will occupy space currently held by PNC Bank, which is exiting this location in June. This will be Farmers National Bank’s second banking office located in Elk County.